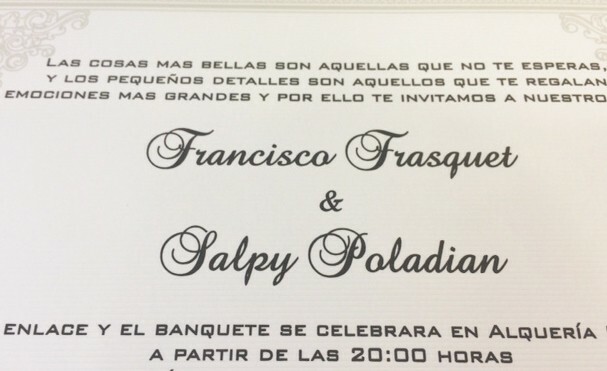 Salpy & Paco’s wedding is coming up in Valencia, Spain, however, they created their custom trilingual wedding invitations here in San Francisco at Hyegraph. Salpy and Paco stopped in while vacationing in Los Angeles and getting ready for their upcoming Chic wedding this fall. 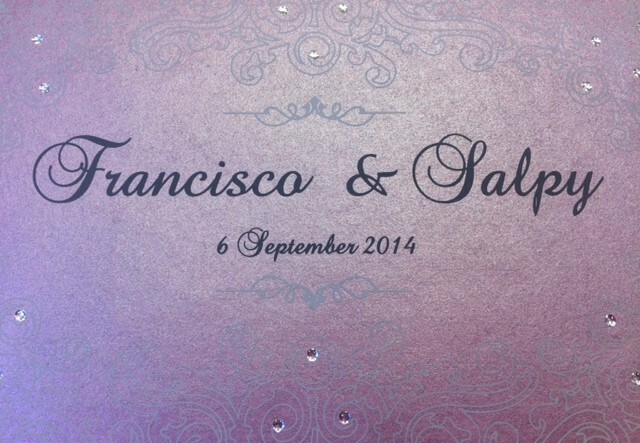 Salpy & Paco chose this lavender and silver combination pouch wedding invitation from our Charu Designers. 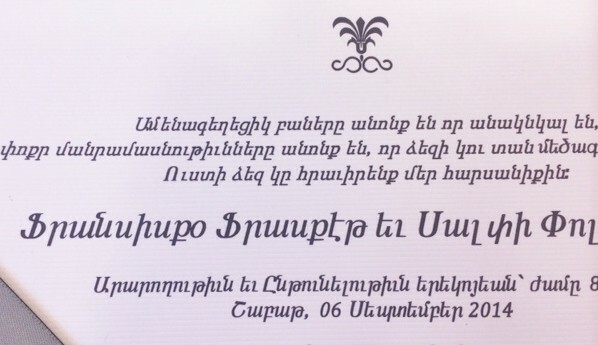 We were able to customize this trilingual invitation for them helping with their Armenian and English texts, while they provided us the Spanish wording. 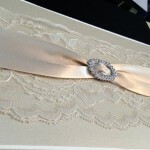 The invitation is adorned with rhinestones, a silver satin bow sash, their monograms and their pre-wedding photo. This would be a rich invitation illustrating many styles in one. The invitation has a very nice tactile feel and is soft to the touch while you can feel the silkscreen printed text and design on the invitation cover as well as the tasteful rhinestones. The inside cover of this pouch invitation from Charu illustrates the Spanish, Armenian and the English versions of the wedding invite. 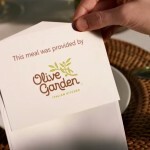 The matching rsvp card is inserted neatly under the silver satin bow. 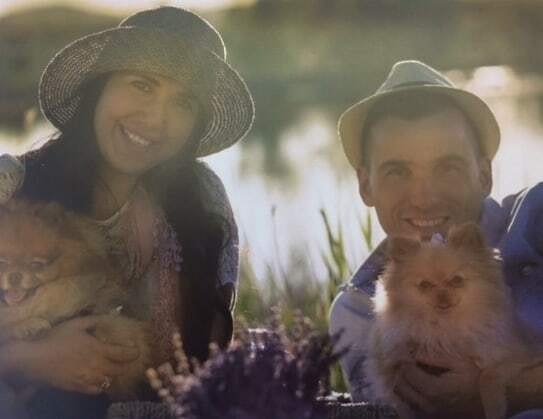 When you flip the invitation to the back inside cover, you see the fancy monograms printed with thermography in charcoal ink, as well as Salpy & Paco’s photo with their pets. This invitation illustrates both silkscreen and thermography printing, it also comes with a 3-D box style envelope to ship or hand deliver. The price for a set which includes trilingual invitations, the rsvp card with envelope and the 3-D box is $15.00 a set or for one language printed invitation it’s $13.00. Please call, email or come in to Hyegraph located at 3 Embarcadero Center, San Francisco, CA 94111 to get a quote or to order your invitations. 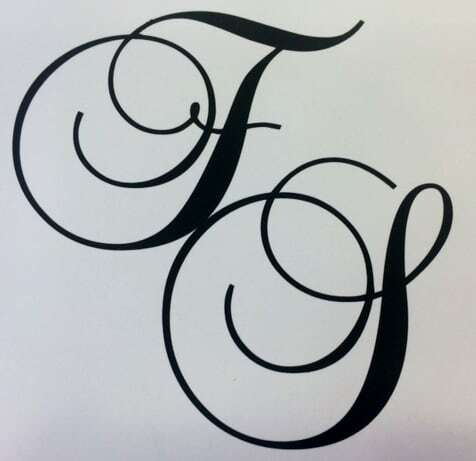 You can also order your Envelope Addressing or other custom stationery items from Crane & Co. or other fine printers when call, email or come in to Hyegraph! 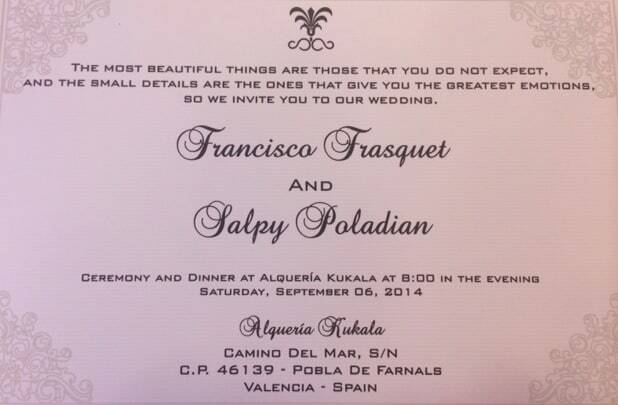 Congratulations Salpy & Paco! !